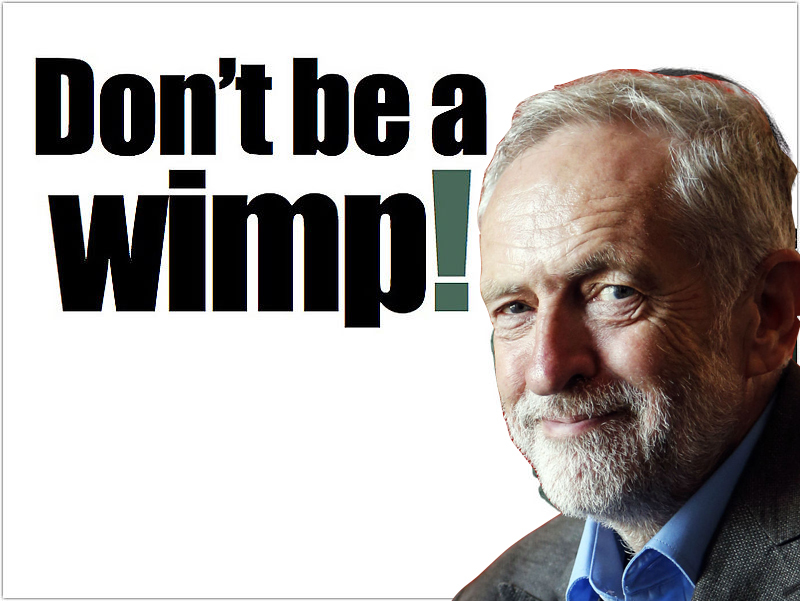 Jeremy Corbyn, the man who just a few months ago was a ‘hope for a change,’ is a wimp. For months, the man has unconditionally surrendered to the Jewish lobby. He has systematically betrayed each of his professed core principles. Not surprisingly, the legendary ‘Left Icon’ has even betrayed his friends. Leftists tend to call each other comrade; they shove the word ‘comradeship’ into every political statement. Apparently, they are unable to grasp what comradeship is all about. Corbyn’s ‘comradeship’ was on display when he failed to stand up for the heroic Ken Livingstone who told the well-established and undeniable truth about Hitler’s support of Zionism and the Havara Agreement. Corbyn just ran away with his tail between his legs. For some time, I have thought the Left a dysfunctional masturbatory concept. But Corbyn was exciting, he seemed to support the oppressed. For decades he was the patron of the dysfunctional Palestinian Solidarity Campaign (PSC). Corbyn promised to care for whatever is left of the British working people. He said all the most exciting things but he has delivered the opposite. Perversely, I have been delighted with the recent developments in the Labour Party. If anyone had so far failed to notice the corrosive impact of Jewish power and Jewish political lobbying, it is now all out in the open. Thanks to the Jewish Lobby and Jewish donors, the Labour Party is not a free place. It is intolerant, it is oppressive, it is an occupied territory. It cares for one people only and these people are not the working class. They are, practically speaking, a bunch of Jewish oligarchs, by far the most privileged people on this planet. Next we are going to learn that Corbyn’s Labour will remove Karl Marx from Labour’s heritage for writing On The Jewish Question. In 1843, Marx realised that “emancipation from huckstering and money, consequently from practical, real Judaism, would be the self-emancipation of our time.” Marx thought that in order to emancipate the world from capitalism, the world must be emancipated from “Judaism.” And in order to emancipate Labour from the Guardians of Judea it must liberate itself from Jewish Zionist oligarchs such as Lord Levy, Lord Sugar, Michael Foster and a few others. It is probably just a question of time before the Labour party suspends the Working Class altogether for interfering with Labour’s Jewish oligarch funders. There is now plenty of evidence that Jewish Lobby politics is incompatible with Western thought and values of freedom. We must choose whether we want to live in a United Ghetto dominated by the likes of Lord Levy and Lord Sugar or whether we prefer to dwell in a United Kingdom that is free and cares for all.